You’re looking at the brand-new, first-ever close-up picture of a black hole. 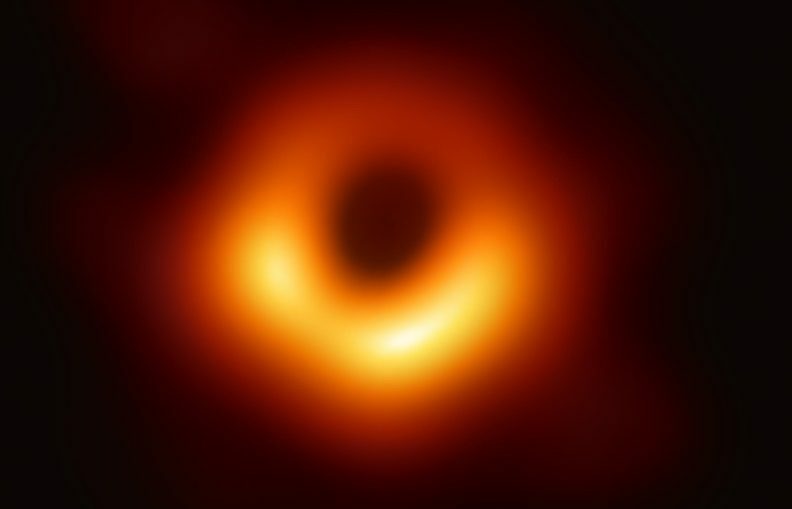 This image of the black hole M87 at the center of the Virgo A galaxy is the result of an international, 2-year-long effort to zoom in on the singularity. It reveals. for the first time, the contours of a black hole’s event horizon, the point beyond which no light or matter escapes. M87 is 53 million light-years away, deep in the center of a distant galaxy, surrounded by clouds of dust and gas and other matter, so no visible light telescope could see the black hole through all that gunk. It’s not the nearest black hole, or even the nearest supermassive black hole. But it’s so huge (as wide as our entire solar system, and 6.5 billion times the mass of the sun) that it’s one of the two biggest-appearing in Earth’s sky. (The other is Sagittarius A* at the center of the Milky Way.) To make this image, astronomers networked radio telescopes all over the world to magnify M87 to unprecedented resolution. They called the combined network the Event Horizon Telescope. That name is appropriate because this image isn’t the black hole itself. Black holes emit no radiation, or at least nowhere near enough to be detected using existing telescopes. But at their edges, just before the singularity’s gravity becomes too intense for even light to escape, black holes accelerate matter to extreme speeds. That matter, just before falling past the horizon, rubs against itself at high speed, generating energy and glowing. The radio waves that the Event Horizon Telescope detected were part of that process. 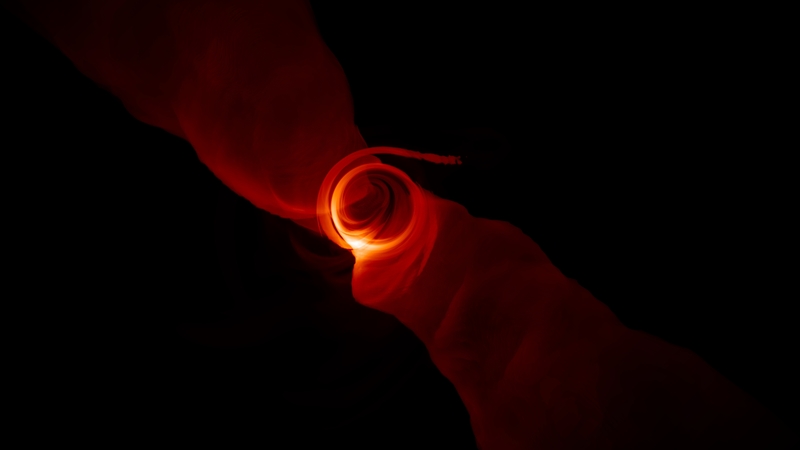 “This image forms a clear link now between supermassive black holes and bright galaxies,” said Sheperd Doeleman, a Harvard astrophysicist and director of the Event Horizon Telescope at a National Science Foundation press conference. Astronomers knew that black holes were surrounded by glowing matter. But this image still answers a key question about black holes, and about the structure of our universe. We now know for certain that Einstein’s theory of relativity holds up even at the edge of a black hole, where some researchers suspected it would break down. The shape of the visible event horizon in the image is a circle, as predicted by relativity, so it confirms relativity still holds sway even in one of the most extreme environments in the universe. What the project revealed instead was about as pure and “true” to Eintein’s theory, he said. This is good news and bad news for physics. It’s good news, because it means researchers don’t have to rewrite their textbooks. But it leaves a key question unresolved: General relativity (which governs very big things, like stars and gravity) works up to the edge of a black hole. Quantum mechanics (which describes very small things) is incompatible with general relativity in several key respects. But nothing in this image yet answers any questions about how the two intersect. If general relativity had broken down in this extreme place, scientists might have found some unifying answers. Data will likely continue to roll in from the telescope network, which is also observing the much nearer (but smaller) supermassive black hole at the center of the Milky Way. Sera Markoff, an astrophysicist from the University of Amsterdam, said that while the collaboration hasn’t yet offered specific details on how black holes produce their giant jets. But she said that further observations of the M87 black hole, which produces dramatic jets, should help to answer those questions. The Event Horizons Telescope project will continue to add telescopes over time and improve its resolution over time, enabling it to answer more questions, she said. Specifically, she said, she’s hopeful that imaging black holes could eventually link up quantum physics and gravity. That linking up, said Avery Broderick, a physicist at the University of Waterloo and collaborator on the project, might eventually allow physicists to “supplant” Einstein. But for now, just enjoy this first glimpse of the edge of a totally unknowable region of space.